What’s the largest area of dirty ground that’s yet to be cleaned? That’s right, it’s the surface of the moon. That thing is just filthy with dust from years of meteorite damage, and that dust was a big problem every time astronauts landed there. Even though lunar dust particles can be tiny, they’re also sharp due to the lack of wind and rain to erode them down after their initial formation. Furthermore, they end up getting charged with static electricity from solar storms which periodically blast them with radiation. The combination of those two properties means that the dust on the moon is especially prone to sticking to equipment and space suits, causing wear, jamming up movement, conducting heat, and blocking solar panels. You wouldn’t want to get it loose in zero-gravity on the way home either, since inhaling it tends to be unhealthy. It’s a menace, and something needs to be done! Something like… sweeping it up. Could it be done? We started by saying that the surface of the moon was a large un-swept area, so it might make sense to go big with a Street Sweeper and try to cover as much surface as possible. However, a machine that big and complex would be difficult to transport to the moon in the first place, let alone getting all of its parts to run in space. In fact, unless we want to attach an extra oxygen tank, we’re going to need to avoid anything with a combustion engine anyway (things don’t combust too well without some oxygen). That leaves us with the sweepers that can run entirely on battery power. That’s how the lunar rover was powered as well, by the way. Since it’s a rather large area we’re trying to clean, let’s also skip out on the walk-behind sweepers. At last, our best option looks to be the Dulevo 120. What’s so different about the moon? Apart from having sharp, electro-static, heat-conducting dust, the moon has some other attributes that could make things more complicated than they are on Earth. Good answer! The lower gravity on the moon makes it the ideal destination for weight loss on a technicality. In the case of our sweeping endeavor, it may actually help us out by making the dirt easier to move when pulling it off the ground and when emptying our machine’s hopper. Here on earth we’ve got a nice atmosphere to help protect us from frying in the sun, and even then it’s fairly easy to get a sunburn without the proper protection. On the moon, you’d be almost completely exposed to the sun’s radiation. On top of that, a single day on the moon takes 28 earth days. These two things combined result in some very hot days (around 212°F) and very cold nights (-279°F). It’s hard enough to imagine temperatures that extreme as it is, but there’s also the added complication of how heat is transferred in the first place. A lot of heat is conducted through physical contact, but without air to transfer the heat, the only way it’d be exchanged on the moon is through the lunar dust and from direct solar radiation. To give us the best chances, we’ll want to time our sweeping to be just between day and night. Furthermore, to protect against heat from the sun’s radiation, the sweeper will need to be covered with reflective/resistant material as much as possible. Even this won’t totally cut it though. 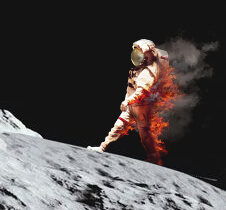 On previous moon landings, astronauts required the use of their space suits’ heating and cooling systems to stay at a reasonable temperature. They also had systems in place to regulate the temperature of their equipment. However, in spite of all that, their equipment still tended to overheat, in part because of the dust. 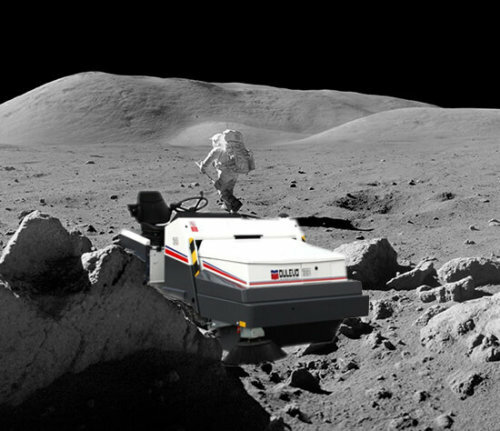 Like the lunar rover, our sweeper is going to need an upgraded cooling system to keep it running. Lucky for us, the Dulevo 120 already has a water-cooling system in place to prepare it for hot climates. Oh good, an easy one. Sweepers don’t need to breathe so we’re good to go. Well, actually… beside the fact that the lack of air is preventing the use of combustion engines, it’s also going to be a heck of a problem to get any sort of suction working without air pressure. On earth, you can pull air away with a fan/vacuum motor which causes the outside air (and dust) to rush in to fill the empty space. On the moon though, it’s all empty space with no difference in air pressure to create that suction. You can fling dust up in the general direction of the hopper with the brooms, but not much is going to go or stay where you want it without a bit of airflow. Although it’d be tricky, there are a few ways of directing the dirt. There has been some successful testing done using magnets and electrical charges to move the tiny moon dust particles, which generally contain bits of iron. As for a suction workaround, it may be possible to use our own gas in lieu of air. There’d likely be some extra gasses left over from the trip to the moon which wouldn’t have much other use. The best solution I could find was proposed as an excavation method by Zacny (et al.) (pictured on the right)1, which essentially used a straw with a gas injection system near the bottom to slurp dust up the tube. Further up the line, the dirt and gas could be separated in order to contain the dirt and reuse the gas. With a combination of magnetic influence and some well-aimed gas-powered funneling, our moon surface sweeper could actually be modified to function. Maybe. To be honest, I wouldn’t actually bet any money on it myself, but I want to believe. 1 Zacny, Kris & Mungas, Greg & Mungas, Chris & Fisher, David & Hedlund, Magnus. (2008). 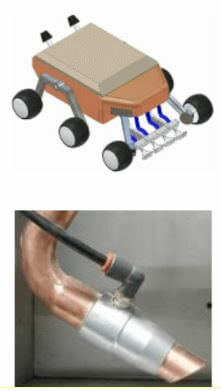 Pneumatic Excavator and Regolith Transport System for Lunar ISRU and Construction. Space 2008 Conference. 10.2514/6.2008-7824.